I think I have mentioned this in a couple other food blog posts, but my wife has a serious obsession with buying Gr oupons. The one big advantage is that they are good for trying new restaurants, this is the case for the Groupon for the Rooftop Lounge/K’Ya at the Casa de Camino Hotel. This location is a boutique hotel that was originally built in the late 1920’s and was a getaway for Hollywood stars. The hotel retains the roaring 20’s glamour and has the ambiance of a upscale European Hostel. The Clientel at the hotel and restuarant is a 30 something hipster crowd. The overall ambiance was provided by the guitar performer, a group of L.A. style hipsters hanging out over cocktails in the lobby and old school decor. Since the Rooftop Bar was closing, we tried K’Ya Bistro. K’Ya Bistro is connected to the hipster lobby of the hotel, so the good vibes were flowing. The menu at K’Ya reminds me of a small plate gastropub, with seasonal Asain-Fusion and Modern American Comfort food dishes. We ordered the Ahi Burger, Cheese Plate, Shrimp Cocktail, Calamari and a couple of their Signature Mojitos. First thing to come out was the Mojito’s. 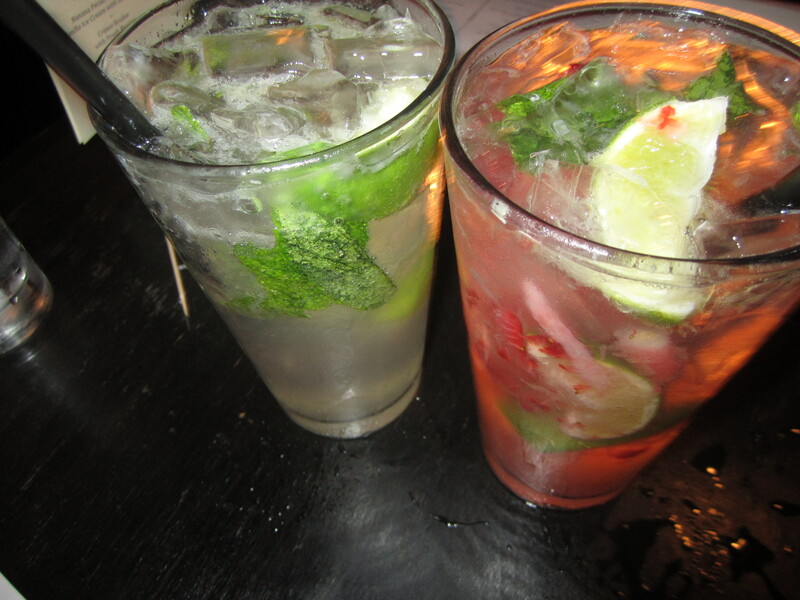 I ordered the Berry Mojito and the standard. We both agreed that the mojitos had the right balance of sugar to rum and mint. These drinks were actually quite strong; although since the bartender has some skills, we didn’t even notice until we stood up. The berry muddled into this drink added a subtle freshness to the flavor and made me want to order another. The Cheese Plate was pretty standard as it included the usual suspects of brie, camembert, blue and gouda. accompanying the cheese was toasted bread, water cracker, dates, dried cranberries, green apples, nuts. 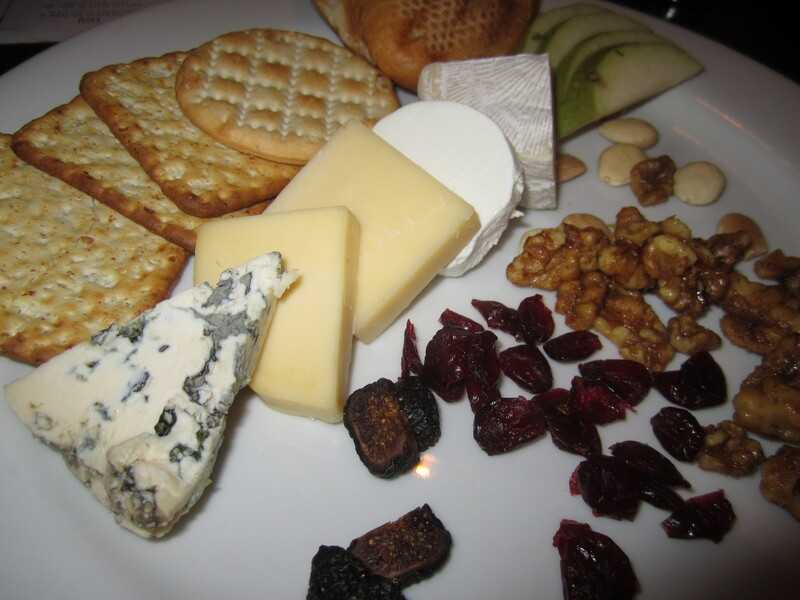 Some of the noteworthy cheeses were the double cream brie and the highly marbled blue cheese. This cheese plate lacked a liquid topper like a fruit chutney, honey or vegetable jam, which is a real shame. The addition of this extra component could have tied all the individual parts together into a dignified cheese plate. The Ahi Burger was my favorite dish of te night. 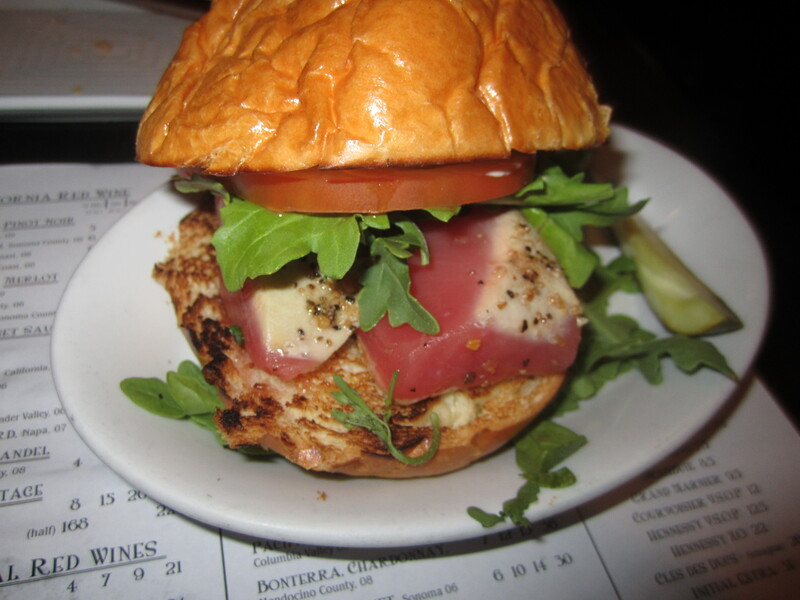 It consisted of a fluffy brioche bun, lightly seared tuna, tomato, arugula, and wasabi mayo dressing. The bread was fluffy, light and squishy to the touch. When I bit into the burger, the texture was soft and pleasant. The slightly firm texture of the tuna complimented the soft and lightly toasted bun. The flavors of the tuna was extremely fresh and vibrant and stood out in the dish. The wasabi-mayo dressing and arugula added a little kick to the gentle flavors and helped tie the dish together. I would highly recommend this dish and it is one of the better ahi burgers I have tried. The Shrimp cocktail was also pretty standard. Not much to say about it, besides the shrimp tasted fresh. The dish came with two sauces, a red cocktail sauce and a mystery green sauce, which was pretty unexciting. 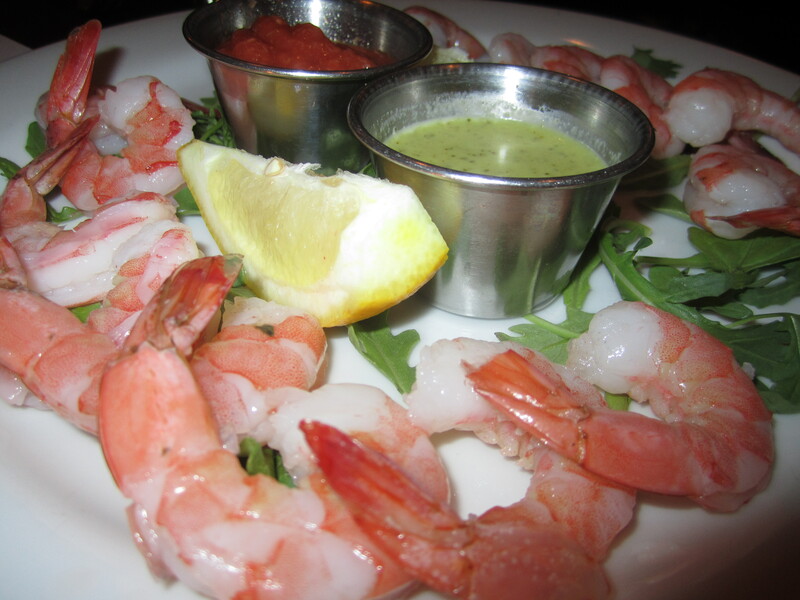 No need to dwell on this dish…it was just shrimp on haphazardly assembled on a plate. This dish would benefit from a more artistic plating. The Calamari was an interesting and tasty dish. 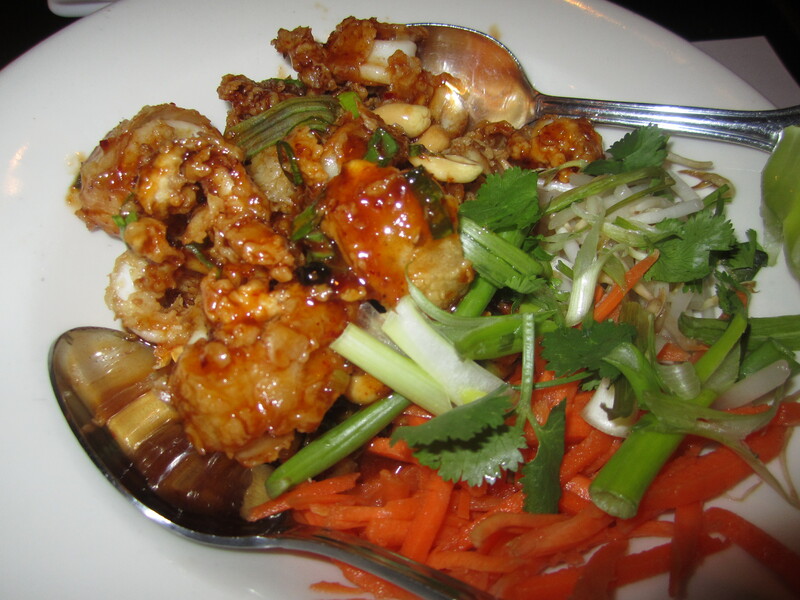 It consisted of deep-fried calamari (rings and tentacles) that was wok’d in a slightly spicy Kung Pao sauce. This dish was also served with fresh shredded carrots, green onions and sprouts. When all the ingredients were mixed together, the vegetables created harmony to the flavors of this dish by balancing the salt of the sauce and the oil from the deep fry. Great textures and great flavors. I recommend this dish. This restaurant was a nice discovery for dinner and as a hangout. This restaurant had a good vibe and some really good food. Two of the four dishes were amazing and two were just above standard. I would come back here for a small plates dinner and some drinks with friends. 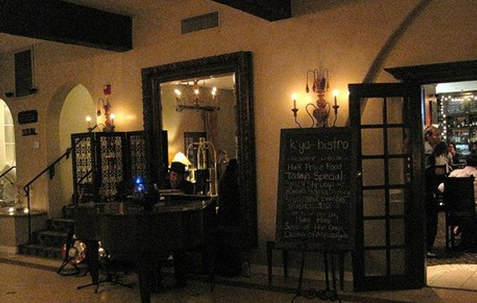 I am giving K’ya Bistro in Laguna a 3.5 of out 5 stars. The restaurant almost got a 4, but the appetizers didn’t impress me enough. I will be back in a couple of months and will report back if I was WOWED by ALL the dishes. I think this restaurant is a gem and the staff appeared to be very engaged and friendly. I predict that my next experience will be even better.